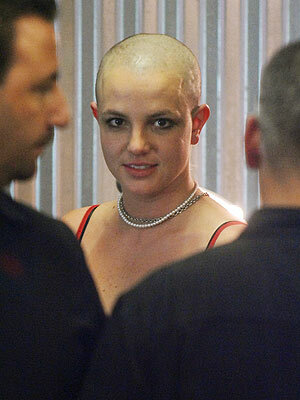 Britney Spears Goes Bald Again ! We already know that Britney Spears is bald “down there,” but now, fresh off her 24 hours in rehab, Britney Spears is bald “up there” too. 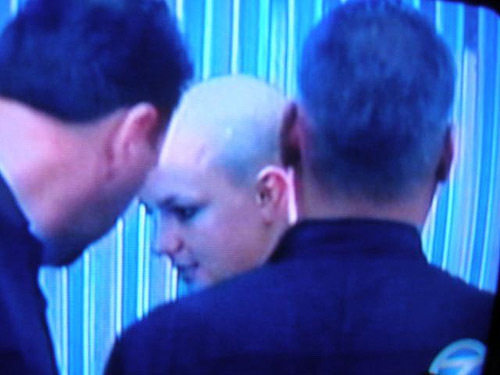 Yes, Britney Spears shaved her head bald. According to US Magazine, the living train wreck flew back to Los Angeles from Miami in Coach class, and went straight into a salon after landing, where asked to have her head shaved. 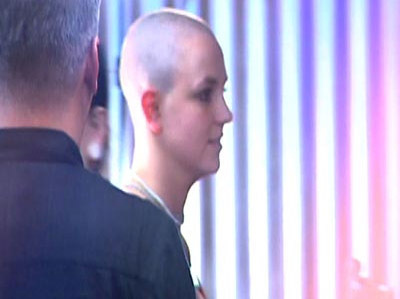 But when the hairdresser said no, Brintey shaved her head herself. Hughes adds, “She wasn’t making sense at all and you could tell she’s not in a good place at all, and that she is totally freaking out.” Hughes tells us Britney then got a black-white-and-pink cross tattooed on her lower hip and red-and-pink lips on her wrist. The price: $80. Um… Can you say cry for help? Britney Spears doesn’t need rehab, she needs a psychiatric asylum. She needs a straight jacket and a padded room, because she is crazy. This entry was posted on Sunday, February 18th, 2007 at 10:29 am	and is filed under Celebrity News, Interesting Stuff. You can leave a response, or trackback from your own site. One Response to "Britney Spears Goes Bald Again !"